I’m writing this knowing I have a number of dog lover followers and not all will be happy with me. I would like your thoughts and opinions on the subject. I, myself, am still very torn. I’ve always felt relatively safe walking Riggins around the neighborhood and letting him off leash on Runyon. I know others have had issues but I never have. It helps that Riggins is a big wimp and runs away from a dog fight vs. right into the middle which tends to be a dog’s instinct. Now that I walk all my dog house guests along with Riggins, I’m getting a little more hesitant. First of all, I don’t know these dogs as well and secondly, I would have a nervous breakdown if anything happened to one of them. Most of the dogs that stay with me aren’t as active as Riggins and me so their folks are trusting me when I say our outings are safe. I love dogs and think, in general, they are sweet loveable creatures. Still, everyday there are articles of dog attacks. One day I read an article on Dogster.com about a woman being attacked by three dogs while on a walk and it pushed me over the edge to do something about the safety of me and my dogs. As I mentioned before most folks in my neighborhood walk their dogs with giant sticks. I really dislike that. I find that just the act of carrying that “weapon” causes dogs to be on guard and more aggressive automatically. Coming at me with any kind of weapon while I’m walking my pack will guarantee you some unhappy dogs! I did research and choose to purchase an animal deterrent spray. 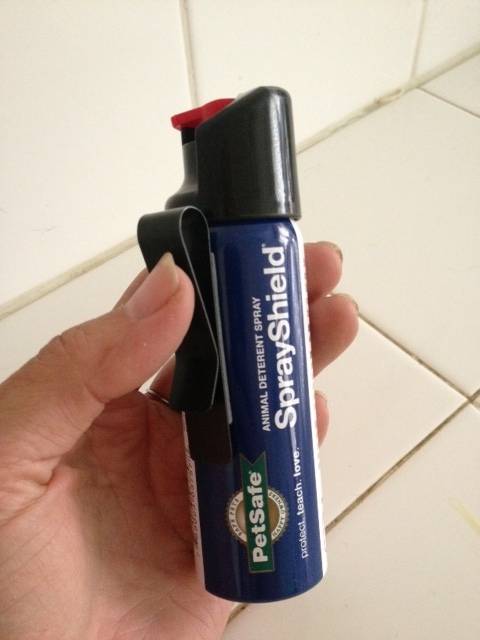 Unlike pepper spray animal deterrent spray is specifically designed to be aimed at a dog’s nose. It’s the smell that causes them to pause and step back giving owners time to restrain anyone involved in a fight. It promises to be safe and not harmful to the pets nor to humans. The reviews on Amazon seem to back this promise. (Ignore the fact that deterrent is spelled incorrectly on the canister. There are a few choices but I picked this one because it had free shipping.) It’s tiny and has a belt clip that I can easily attach to my pants, fanny pack, or backpack. The product does warn that it isn’t effective on all dogs pointing out that super aggressive dogs may not be stopped. Let’s face it … what is really going to stop a super aggressive dog? Not much. Mace is another choice that some folks go with. If you choose this you need a smaller active ingredient % than what you would use on humans. I wasn’t ready to take the leap to mace. I haven’t needed to use the spray yet and I really don’t want to. If the situation arrises where I do need it I hope I remember I have it! So what do you think? I want to know. 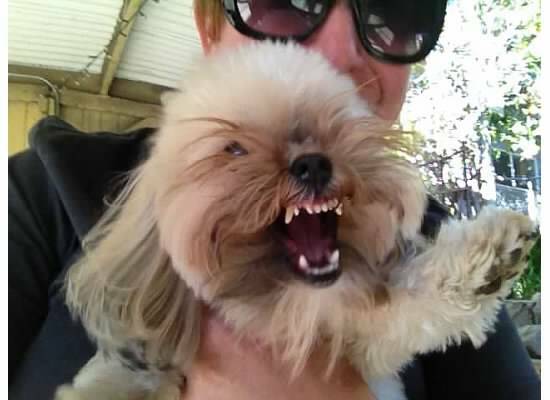 As fellow dog lovers what do you consider the safest way to deal with aggressive behavior while out and about with your dog(s)? Personally, I think you taking precautions is best for everyone involved. I have a very large dog and have come across several instances of dogs attacking him. I carry a spray bottle with me everywhere I go, because I never know if I will need to use it to break up a fight. Naturally, Alfie is not aggressive, but you never know the behaviour of a strangers dog. I know Alfie can hold his own and it’s only about 10 seconds before my humungus monster has them pinned on the ground and then the owners normally starts to freak. I walked Afie off leash around horse property for awhile and this guy called animal control and the police on me, then followed me in his car. There was no leash law in that county if they were voice command trained. I was like, “Dude..do you freak when a horse walks by?” grrrrrr…From then on, I pretty much keep Alfie on a leash until we get to a park, and then I let him run. I don’t at all do it for him..I do it to keep the crazy humans calm!!! Arm yourself to the teeth!